Whether used to serve desserts or appetizers, the Crestware CM31 Dover White Fruit Dish 4-5/8" is an excellent dinnerware solution. Perfect for use in both casual and formal dining, this classic bone white bowl is designed with a chip-resistant narrow rim body that beautifully frames food. 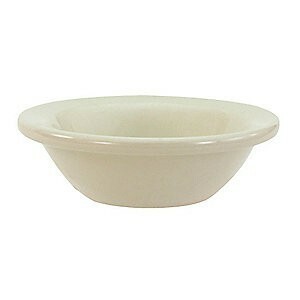 Made from vitrified ceramic, this fruit dish resists moisture absorption and is oven and microwave safe. For convenient usage, this fruit bowl is dishwasher safe.